1) It is native to Tennessee and throughout much of the Southeast, Mid-Atlantic and New England. 2) It has a reputation of being a tough and adaptable plant, capable of tolerating wet clay soils. Some sources also say it has good drought tolerance. 3) The Pollinator Partnership says that Cornus amomum flowers attract bees and butterflies. 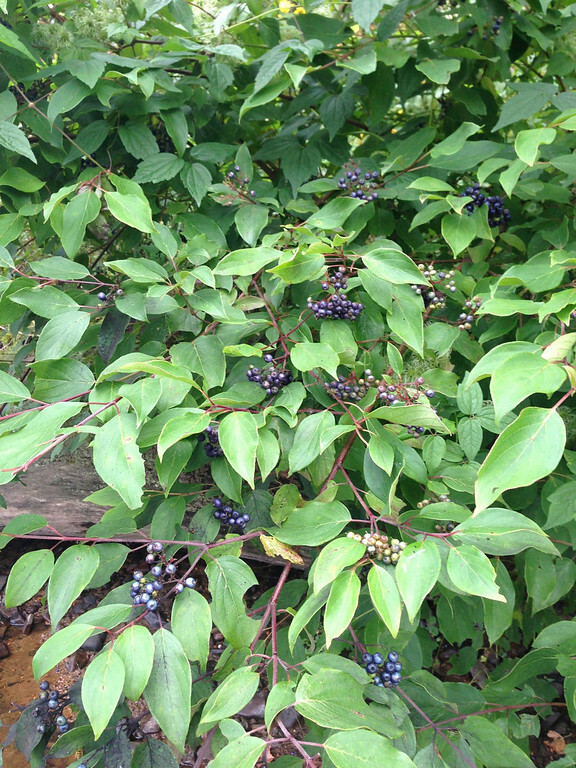 4) A University of Rhode Island fact sheet says that silky dogwood berries are eaten by many migratory songbirds. 5) It has red stems that provide winter interest. 6) I've heard it can be propagated very easily using a live staking method. So if it grows well here, it's good to know I may be able to take cuttings and get some free plants. Do you grow silky dogwood? If so, what has been your experience with this plant?